Incoterms (International Commercial Terms) are a set of international rules for the uniform interpretation of common contract clauses in export/import transactions. They were first published in 1936 by the International Chamber of Commerce (ICC) in Paris, and are updated periodically. 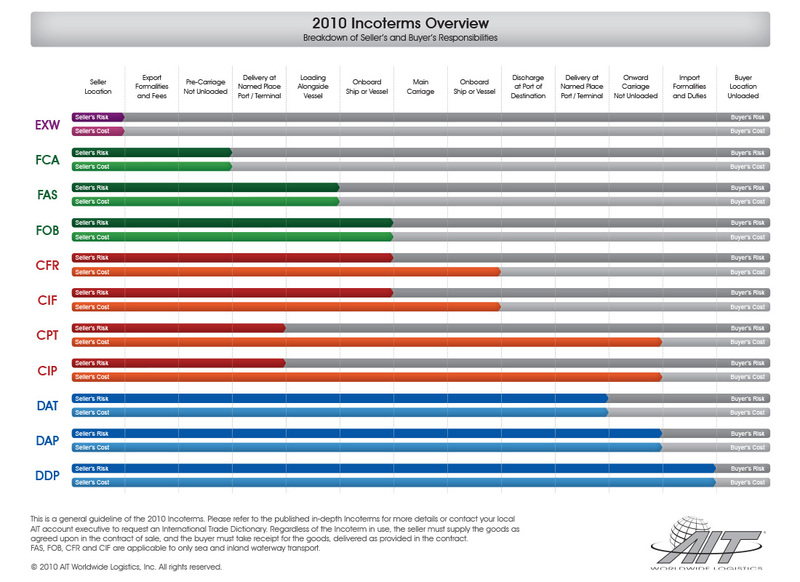 The latest version, Incoterms 2010, was launched in September 2010 and became effective January 1, 2011. Incoterms are key elements of international contracts of sale intended to guide parties with respect to carriage of goods from seller to buyer along with export and import clearance. Incoterms also explain the division of costs and risks between the two parties and at what point the responsibility shifts from seller to buyer. Incoterms allow electronic communication, such as EDI and electronic documents as long as both parties agree. They are not laws enacted by governments, but rather, rules agreed to by parties to a contract. Incoterms have two components – the terms name and a name place. It is incomplete if one is missing. The existing 11 Incoterms are broken down into four color-coded categories for easy navigation, reading and understanding. Caution must be exercised when using Incoterms because they relate to particular modes of transportation. The terms FAS, FOB, CFR and CIF are applicable to only sea or inland waterway transport. All other Incoterms can be used for all modes of transportation - air, ground, rail and ocean. A short glossary related to Incoterms can be found here.